little bee books, 9781499802399, 40pp. 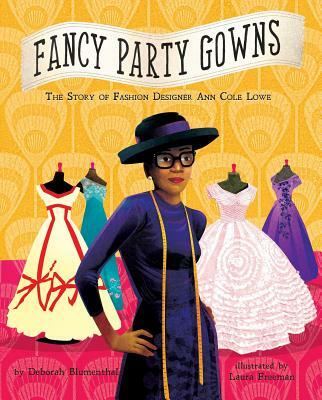 A beautiful picture book about Ann Cole Lowe, a little-known African-American fashion designer who battled personal and social adversity in order to pursue her passion of making beautiful gowns and went on to become one of society's top designers. Ann's family came from Alabama. As soon as Ann Cole Lowe could walk, her momma and grandma taught her to sew. She worked near her momma in their Alabama family shop in the early 1900s, making glorious dresses for women who went to fancy parties. When Ann was 16, her momma died, and Ann continued sewing dresses. It wasn't easy, especially when she went to design school and had to learn alone, segregated from the rest of the class. But the work she did set her spirit soaring, as evidenced in the clothes she made, including Jackie Kennedy's wedding dress and Olivia de Havilland's dress at the Oscars when she won for Best Actress in To Each His Own. Rarely credited, Ann Cole Lowe became "society's best kept secret." This beautiful picture book shines the spotlight on a little-known visionary who persevered in times of hardship, always doing what she was passionate about: making elegant gowns for the women who loved to wear them. Deborah Blumenthal is an award-winning journalist and nutritionist who now divides her time between writing children's books and adult novels. She has been a regular contributor to the New York Times, as well as to Long Island Newsday as a home design columnist. Her feature stories have appeared widely in many other newspapers and national magazines including New York's Daily News, theWashington Post, the Los Angeles Times, Bazaar, Cosmopolitan, Woman's Day, Family Circle, Self, and Vogue. She lives in New York City. Find out more about her at deborahblumenthal.com. Laura Freeman received her BFA from the School of Visual Arts in New York City and began her career illustrating for various editorial clients, including The New York Times Book Review, The National Law Journal, and New York Magazine. She also worked as a computer artist in the men's design department of Polo/Ralph Lauren. Laura now lives in Atlanta, Georgia, with her husband and their two children. Find out more about Laura at lfreemanart.com.